The mission of the Laboratoire d’Astrophysique Expérimentale (LAE) is to face the technological challenges necessary for the conception of new high performance instruments designed for a better understanding of the universe. Recent technological developments offer new and exciting possibilities for astronomy. Due to the ever increasing complexity of modern technologies, astronomy has to make use of the skills and the expertise of scientists, engineers and technicians. The technological problems exposed challenge scientists as well as engineers, and provide an ideal environment for the formation of students in applied physics and engineering. The LAE, which regroups the competences of the three universities that are part of the CRAQ, follows an approach focusing on specific projects, and its mission favours the formation of specialists who gain expertise in high technology instrumentation for astrophysics and space science. The LAE focuses its interests on the conception, the development and the manufacturing of astronomical instruments and opto-mecanical systems. The main objective is to produce instruments that will be used on university observatories, national telescope, international observatories (including the upcoming "extremely large telescopes"), and even space telescopes. 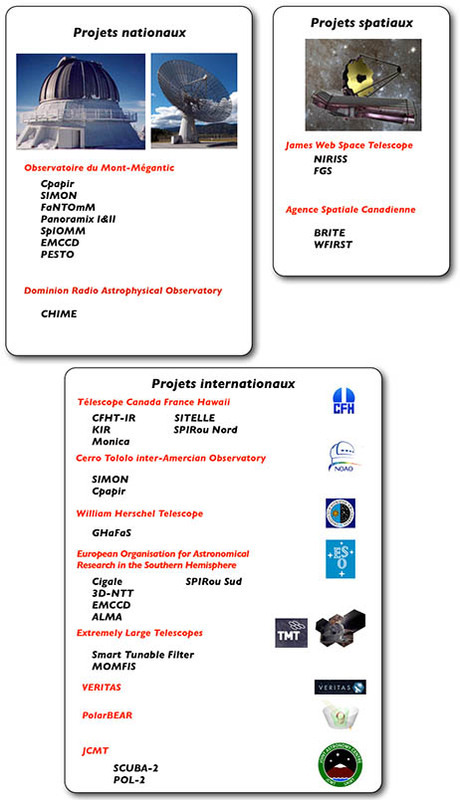 The following tables lists the different projects on which members of the LAE are active participants (the telescope names are indicated in red and the instruments are in black).